Abundant natural resources, a growing labor force, and proximity to consumer markets in Europe and Asia make Africa an attractive target for foreign exploration—despite social unrest and a need for more government collaboration and logistics infrastructure investment. In many ways, Africa's potential as a manufacturing and logistics hotspot mirrors the continent's greatest allure: an abundance of raw, natural riches such as gold, diamonds, precious metals, timber, oil, coffee, cotton, and cocoa that has paved the way for investment from companies and countries looking to tap these valuable commodities. Over the past few years, the United States, France, and China have jockeyed for position as the continent's most aggressive suitor. China's motive is clear: Africa's energy and agriculture affluence is a great source for fueling and feeding a growing middle class. And now a new player has entered the game: Malaysia. The Southeast Asian country has trumped China in the size of its foreign direct investment into Africa, according to recent United Nations data. Still, much of this outlay has been exploitative rather than constructive. The Democratic Republic of Congo's struggle with conflict minerals serves as a microcosm for similar abuses elsewhere on the continent. Socio-political instability, civil war, disease, corruption, piracy, and nepotism have all impeded economic development. Yet the continent is brimming with potential—far beyond the mines, manufacturing plants, and crop fields that incent foreign exploration. Authorities are hoping current and future government investment in Djibouti's port complexes attracts global private investors. Located on the Horn of Africa at a critical gateway between the Gulf of Aden and the Red Sea, Djibouti's economy is heavily reliant on import, export, and re-import trade with Ethiopia—Africa's second most populous nation and one of the fastest growing economies in the world. In 2011, DP World, the third-largest global port operator, announced plans to triple the size of Djibouti's existing port. The $396-million expansion will increase Doraleh Container Terminal's container capacity from 800,000 TEUs to 1.7 million TEUs during the first phase, and to three million TEUs in the second phase. Plans are also in the works to develop a free trade zone to further boost port traffic. The Port of Durban, located on South Africa's eastern bend, is the largest container hub on the continent. Durban, the country's third-largest city, is a bustling center of commerce, increasingly defined by its domestic industries. The past two decades have seen a marked uptick in the gross value-added contribution of the financial and manufacturing sectors, according to a recent economic development report by eThekwini, the metropolitan municipality within which Durban resides. Other industries such as mining, agriculture, and construction have either remained static or declined. Consequently, the transportation, storage, and communications sector experienced the highest overall growth in the past 15 years (5.3 percent), with the financial and business sector following closely behind (5.2 percent), according to the report. The focal point for Durban's economic growth remains the port, and capacity is expected to almost double to five million TEUs over the next decade. 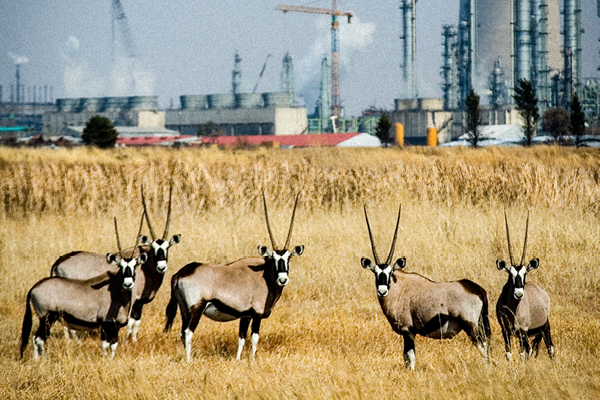 The South African government has pledged $33 billion toward further infrastructure development throughout Transnet, the country's rail, port, and pipeline company—$2 billion of which will be specifically earmarked for the port. This outlay does not include other capital that has been directed toward its sister company Transnet Port Terminals. China's insatiable appetite for infrastructure investment at home and abroad led the country to help finance the construction of a new port at Bagamoyo in Tanzania. The project aims to decrease congestion at the nearby port of Dar es Salaam, where lack of space limits expansion. In March 2013, Tanzanian President Jakaya Kikwete and Chinese President Xi Jinping signed 16 agreements for development projects on mainland Tanzania, and three agreements for Zanzibar. The deals clear the way for China to finance and build a $10-billion port at Bagamoyo, as well as other infrastructure projects. China's play in Tanzania is incentivized by the presence of abundant mineral resources in the region, including iron ore, gas, oil, and coal. A port at Bagamoyo would facilitate China-bound shipments of minerals from Zambia, Zimbabwe, and the Democratic Republic of Congo via the Indian Ocean. Currently, shipments need to be routed through the Kenyan port of Mombasa and the South African port of Durban—both of which are circuitous and costly options. The Tanzanian government hopes the new port will become an East African trade hub for Indian Ocean shipments, and help expose other landlocked countries in the area. China has committed to a $500-million installment in 2013 to initiate the port project, which is scheduled for completion by 2017 and is expected to expand Dar es Salaam's capacity from 800,000 TEUs to 20 million TEUs. Whether that is a realistic goal remains to be seen, but all eyes will be on Bagamoyo for the foreseeable future.